What’s the shortest distance between files on your hard drive and the web? The makers of Min.us think they have the answer. 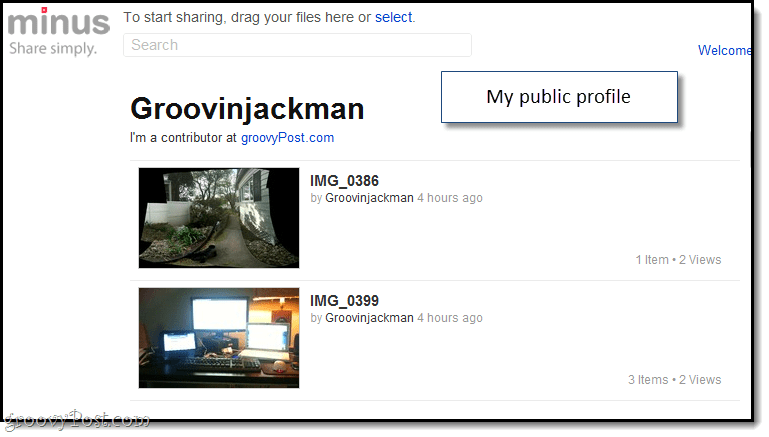 Over at the totally groovy URL min.us, you’ll find one of the simplest file sharing services on the web. Ready for a getting started tutorial? Update: Minus has introduced a few key improvements and updates. Read our updated Minus review here. 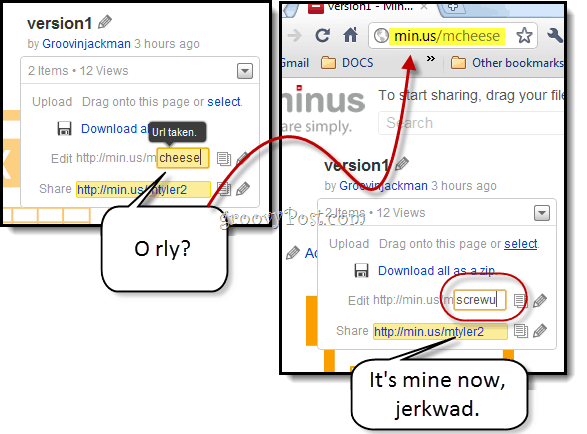 Step one: Drag and drop a file onto the Min.us homepage. Notice I didn’t mention registering a new account, confirming your email address, logging in, downloading a uploader client or any of that jazz. While you can do all of this with Min.us, you don’t have to. And that’s the beauty of it. Here, let me show you around the place. Min.us allows you to upload and share any file up to 50 MB without registering. According to their FAQ, the only information that they collect about guests is their IP addresses, just in case you upload something illicit or extremely inappropriate. Image files, PDFs, text documents and most music and video files will preview or play right in the min.us website, and Microsoft Office support is coming soon. 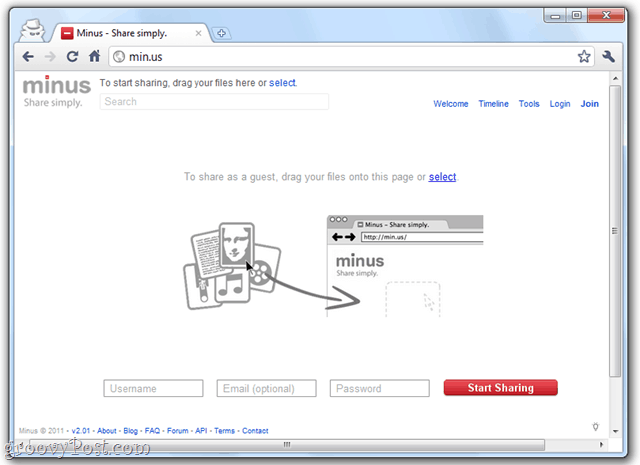 When you upload a file, either by dragging and dropping it into a browser window with min.us open (dragging and dropping not supported for Internet Explorer) or by browsing for the file, it is automatically uploaded and given its own shareable URL. 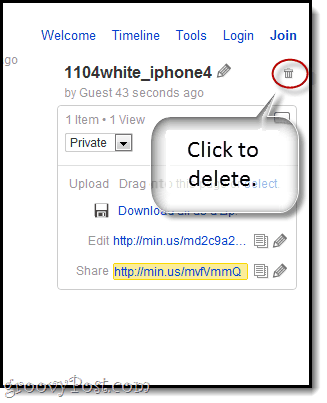 As a guest, all of your uploads are designed as Private, meaning only those with the link can view it. 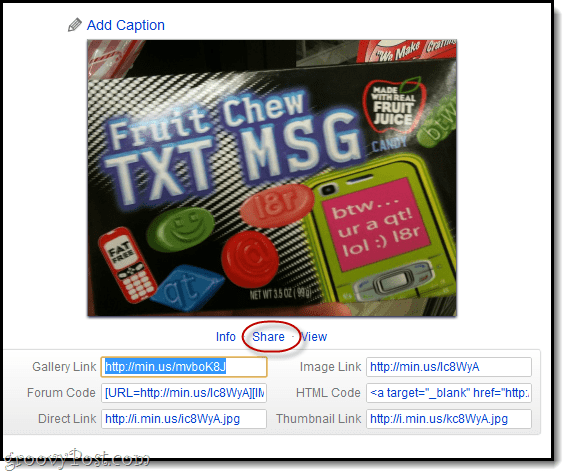 All of your link and embed codes are copy-and-paste-able from the Share link at the bottom of your picture. As far as additional info about the media, there isn’t much you can do. You can change the title and add a caption. 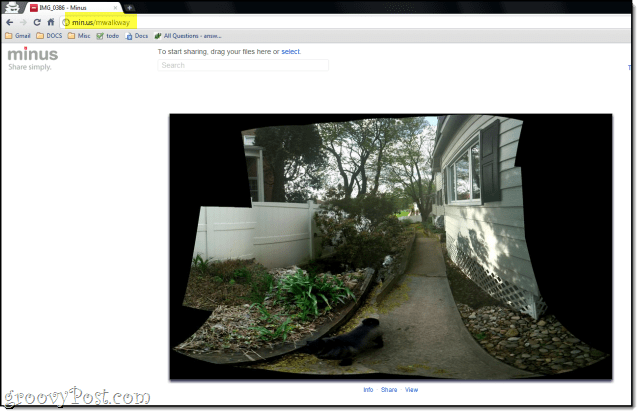 You can also see how many times your image has been viewed by Clicking the Info link. Editing your uploads as a guest is actually pretty ingenious. It works a bit like posting to Craigslist. 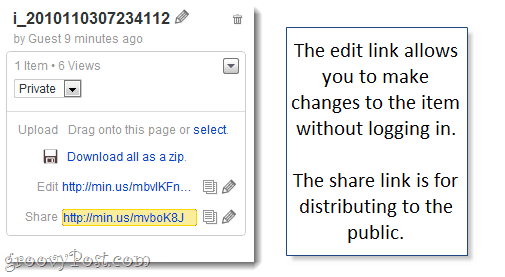 When you upload a file, you get two links: an edit link and a share link. Anyone with the edit link gets privileges for changing the caption or title. With the share link, you can only view it. Just make sure you hand out the right one. 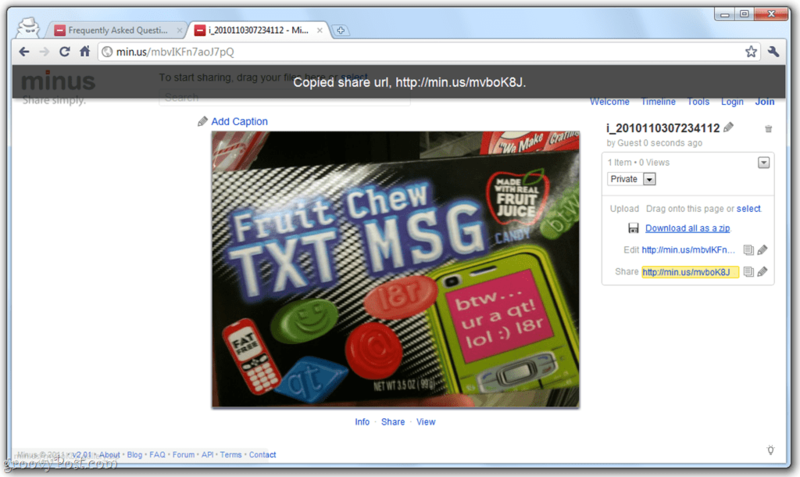 You can also create galleries of up to 30 items on Min.us. In fact, when you upload an item it becomes a gallery of just that one item. If you drag and drop multiple items, they’ll be added into the same gallery. Or, you can drag additional photos or files into the edit screen of a gallery and it’ll show the “add more” message. Release to add it to the current gallery. 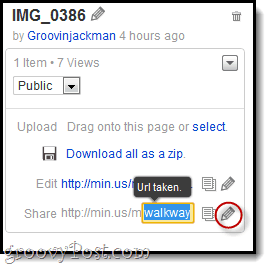 When viewing thumbnails in a gallery, you can move through items using the arrows on the screen or on your keyboard. Nice. 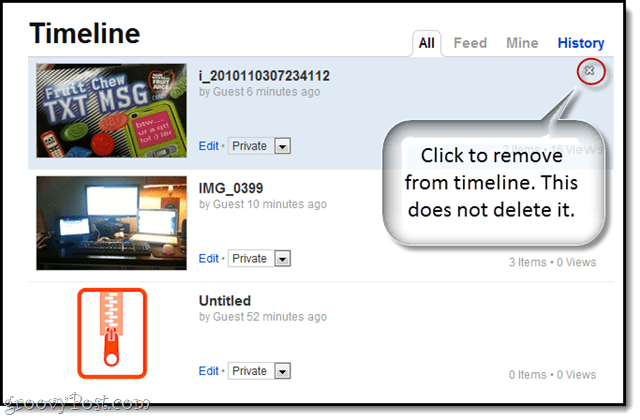 As a guest, Min.us tracks your Timeline of the images that you’ve uploaded and/or viewed. You can remove items from your timeline by Clicking the X that appears in the top-right when you mouse-over. However, as a guest you should be careful not to forget the Edit url, because without it, you cannot delete items from Min.us. To do so, visit the Edit link and then Click the Trash can in the top-right. Registering for Min.us, isn’t required, but it gives you a few more features. All you need to register is a username and a password. Email is optional, so if your worried about getting spam from Min.us, don’t. …and in search results for anyone you follow. You can choose whatever you want. Same goes for the edit link, which serves as a stand-in for password protection. The only caveat is that all links will have m before them and there’s a 40 character limit. It’d be nice if you could have one or two unique characters to differentiate your custom URLs, instead of the obligatory m. At any rate, I really don’t recommend uploading anything crucial or sensitive. But if you’re looking for a secure file sharing service for transmitting nuclear warhead arming codes, then you shouldn’t even consider something like min.us in the first place. Update: Min.us is indeed working on password protection for galleries, which should solve this double-booking issue 100%. Besides, the chances of someone stumbling upon an edit URL are pretty slim—and you shouldn’t be making your edit URL anything memorable anyway. It’s noteworthy that min.us is based on the open source project DropMocks, created by Google Chrome designer Glen Murphy. But min.us has done quite a bit to improve DropMocks, and it seems like they’re just getting started. Min.us is by far the best drag and drop uploader based on DropMocks that I’ve seen. The case for switching to min.us is less compelling when compared to say, imgur, which also features drag and drop uploading without registering. Min.us is far more permissive than imgur in terms of its file size limits and hotlinking. 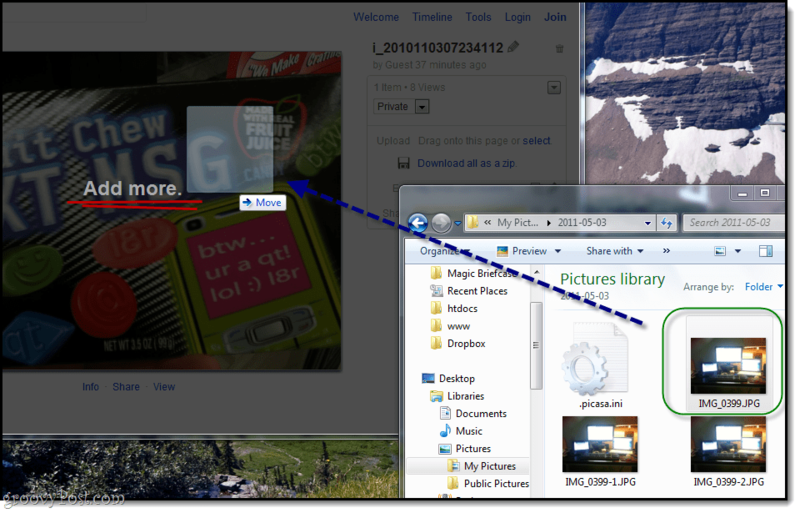 Not only that, min.us supports file types other than images. Min.us also has a mobile app for iPhone and Android, which I don’t think exists for imgur (at least not officially). But imgur has one crucial leg up on Min.us—they are profitable, and therefore sustainable. Or at least they have been since February 2009. 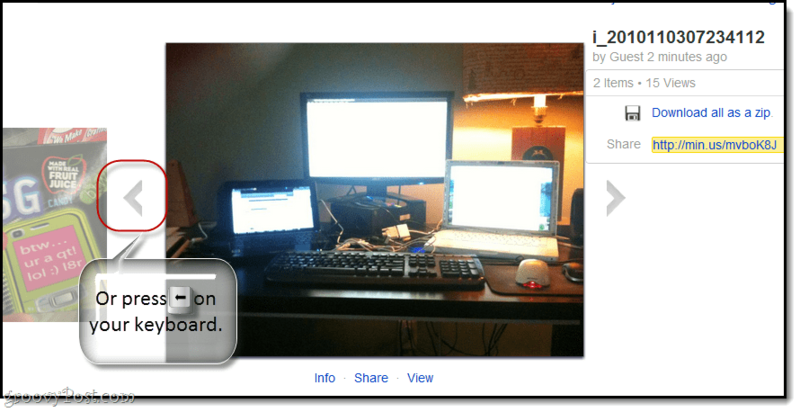 We’ve learned some lessons about awesome, easy file sharing services like drop.io (RIP). 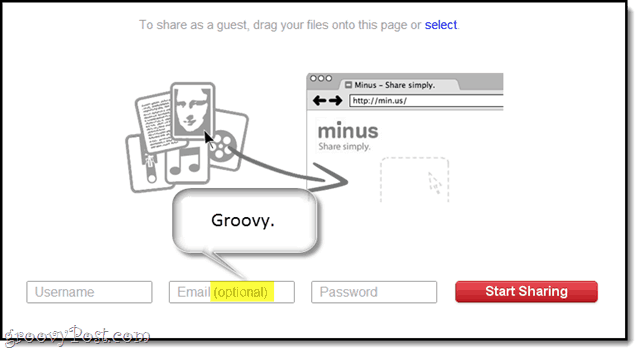 The question here isn’t whether or not min.us is a groovy service–because it definitely is. The question is: how are you going to make this profitable, so I can be sure that you won’t break my heart by disappearing tomorrow? How are you different from say established file sharing companies like Dropbox and SugarSync? That’s a question that the folks behind Min.us are still working on—they say they have a few ideas in the hopper, but we’ll have to see. I’m thinking any kind of aggressive ad support would seriously detract from the minimalist philosophy and function of the site. But the Amazon EC2 and S3 Cloud Storage and NetDNA Content Delivery Network that make Min.us possible definitely ain’t free.